Recommendation: Murder, Mystery and Intrigue going beyond just jealousy and leads to spies and inventions - mind boggling to watch the sequences unfold. 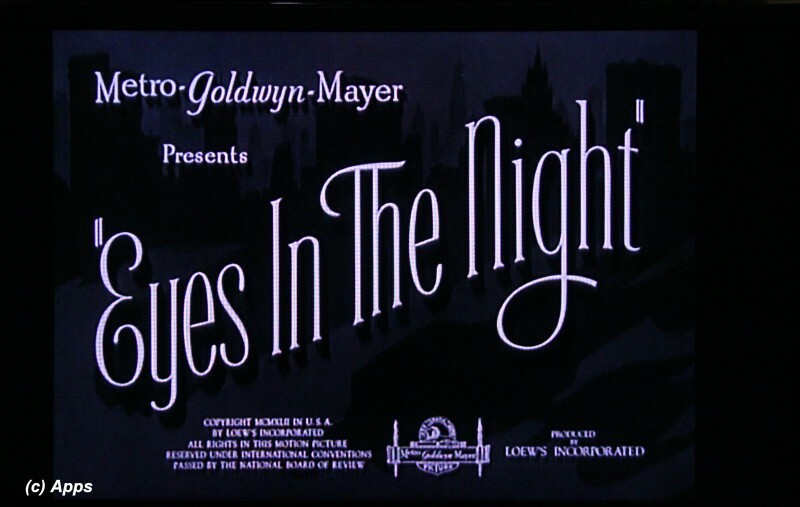 Eyes in the Night is a 1942 American crime mystery film starring Edward Arnold, Ann Harding and Donna Reed. This was a successful movie based on the 1941 novel The Odor of Violets by Baynard Kendrick. The basic plot is about a blind detective who is helping his retired actress friend and her step-daughter investigate a murder. Duncan "Mac" MacLain (portrayed by Edward Arnold) is a blind detective living in New York with his faithful guide dog Friday, his butler Alistair (portrayed by Mantan Moreland) and his assistant Marty (portrayed by Allen Jenkins). One day he is visited by an old friend, a retired actress named Norma Lawry (portrayed by Ann Harding) who is married to reputed scientist Stephen Lawry (portrayed by Reginald Denny). Stephen has been working on a secret invention in cahoots with the government. However Norma approaches Mac with regards to her 17-year old step daughter Barbara Lawry (portrayed by Donna Reed) and her obsession with Norma's ex-lover Paul Gerente, and the ways that Paul was poisoning Barbara's mind against Norma. After seeking counsel and at advice from Mac, Norma meets Paul to reason with him but to no avail. Later that night Barbara just to spite Norma goes to meet Paul at his apartment for dinner only to find him murdered with Norma in the room. No matter how much she tries to explain Barbara doesn’t believe that Norma didn’t kill Paul and threatens to get her arrested unless she leaves her father. Norma agrees but enlists the help of Mac to investigate the murder of Paul Gerente and also help her in resolving things with Barbara. Who killed Paul? Why was Norma at Paul's apartment? Is it all what it seems so plain and simple - a murder committed out of rage? Or does Mac find out much more that this that connects the Lawrys somehow into the murder? Thus the plot continues spinning into a fabulous tapestry of murder, mystery and intrigue. Donna Reed presents herself perfectly as Barabara, a spoilt rich brat who hates her step-mother more than her share and doesn’t hesitate to do anything to get rid of her. I almost hated her character which in itself is a testimony to her acting skills. The conversation between Alistair the butler and Friday the dog is very comical and so natural that one forgets that Friday is a dog. How well Mantan Moreland portrayed his role of Alistair in those situations only says how great an actor he was. Edward Arnold supremely excelled in the role of a blind detective along with the rest of the characters who fit the part. A brilliantly made mystery thriller with a tinge of espionage and jealousy blended in making it a perfect formula to keep you wanting to watch till the end. If you get a chance to see it don’t miss it. 1) I havent read the book, and adding it to my list of books to read in future. 2) A 1945 sequel titled The Hidden Eye was made starring Edward Arnold in the lead again. Will have to look for this movie to air and watch it. 3) The dog playing Friday is originally named as Friday too.